We are absolutely ecstatic this month! Tenkara has reached the mainstream through the words of 3 of the most respected anglers and writers in the US: Lisa and Ralph Cutter and John Gierach. These articles were published in what I have come to perceive as two of the most progressive magazines in the industry: California Fly Fisher, and Fly Rod and Reel. these magazines have been ready to tell their readers about tenkara, a new development in the US, which I think proves their editorial integrity and that they are concerned with telling their readers what is new in fly-fishing as opposed to just pushing their advertisers’ wares. Kudos to these two magazines. Ralph and Lisa Cutter on a rest at midday by the Truckee River – all their gear between them. John Gierach hitting a nice pocket in a small mountain stream. I think the Cutters and Gierach’s readers deserved to learn about tenkara. 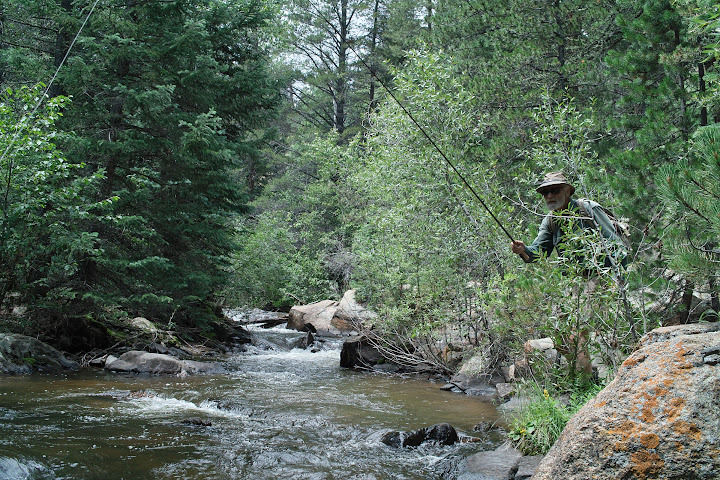 After all they often talk about mountain stream fishing, and how could you ignore tenkara when that is one of your favorite kinds of fishing? It’s awesome that they have been able to see why tenkara is here to stay. Good news for tenkara and Tenkara USA. I’ll pick up my copies this weekend if they are in news stands by then. Thanks for the kind words about kind words. Since the California Fly Fisher piece I’ve been approached by several people who are justifiably intrigued by tenkara. This may be the year when tenkara achieves critical mass and will no longer be viewed as some perversion of fly fishing. It IS fly fishing!! Ralph, thank you for taking your time to comment here. I totally love your article, and Lisa’s illustration. I’ll be laminating this one for the “tenkara museum”. Hope we can fish soon, there will be a short window of opportunity, I’m guessing, between good temps and runoff. Let me know when you guys want to go again. Great articles Daniel. Thanks for writing the article Mr. Cutter. I enjoyed reading what you had to say.